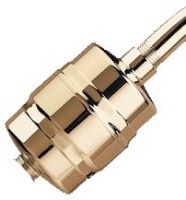 Solid metal Gold High Output shower filter without a showerhead. Filter lasts roughly 1 year. Choose this option if you already have a showerhead you like or want to add a Oxygenics showerhead. The Sprite High Output All Metal Shower Filter has a solid brass filter housing that comes in an elegant jeweled polished gold finish. It is guaranteed not to crack, spot or tarnish.